The grant is part of $33 million that was given to the Ohio Department of Education last fall by the U.S. Department of Education to improve the literacy skills of students who struggle with reading comprehension. Only 46 of the 101 entities who applied received the grant. “I’m excited about offering additional literacy support for our students. A student’s literacy ability is directly related to reaching their full potential in life after they graduate” Chris Gibowicz, Director of Curriculum and Instruction at ACS said. The grant received by ACS will focus on improving literacy outcomes for students grades preschool through 12 and will be distributed over the course of three years. 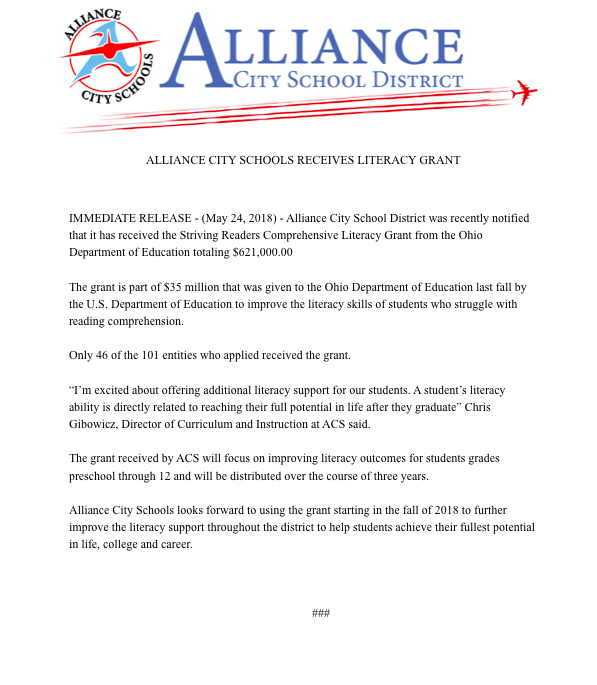 Alliance City Schools looks forward to using the grant starting in the fall of 2018 to further improve the literacy support throughout the district to help students achieve their fullest potential in life, college and career.